Modern advances in science have meant that our models of diseases have vastly improved. Be that in a dish in the laboratory, a computer simulation or through using a transgenic mouse, there have been developments across the biomedical field that have given us a greater understanding of diseases and how our bodies work. This increase in knowledge has meant that we are finding may drugs already on the market can treat a variety of diseases – those involving the same pathway or cell type. This is precisely what happened this month with a drug called Rituximab. Rituximab was licensed in 1997 for use in the treatment of Non-Hodgkin’s lymphoma (NHL) – a cancer where cells of the immune system called B-cells mutate and divide abnormally. The cancer then spreads around the body when the B-cells clone themselves in replication. Since it’s initial approval for use in NHL, rituximab has been used to successfully treat advanced rheumatoid arthritis and has also been part of anti-rejection treatments for kidney transplants (both involve B cells. Then news came last week that it could even slow the progression of rheumatoid arthritis (RA) in the early stages of the disease. Rituximab is an interesting drug, as it is a chimeric antibody. This means that it contains portions of both human and mouse antibodies mixed together. The first papers reporting on rituximab were published in 1994. The first looked at its creation, and the second reported on the phase I clinical trials of the drug. The human immune system works by using antibodies as their ‘messengers’. The antibodies contain multiple regions that allow them to work effectively. One part of the molecule binds with the foreign molecule; the other part then recruits the immune cells to destroy the molecule and eliminate it from the body. The B-cells mutated in NHL and involved in RA are part of the human immune system and are responsible for making antibodies against ‘foreign invaders’. Mature forms of B-cells have a protein called CD20 on their surface. The protein CD20 was the target for a team in San Diego (1) in 1994. Because NHL and RA are characterised by excessive levels of, or mutated B-cells, they looked at ways to reduce their numbers. The researchers determined that CD20 was the perfect target on the human B-cells as it was located on the surface of the cell and it didn’t mutate, move inside the cell or fall off in the life cycle of the B-cell. The team then produced an antibody that would attack CD20 itself, so it would bind to the outside of B-cells, flagging them to the immune system to be eliminated. They identified a mouse antibody that had high anti-CD20 activity. They then constructed a “chimeric” antibody containing the variable domain of the mouse antibody, the portion that specifically binds CD20, along with the constant domain of human antibody, the portion that recruits other components of the immune system to the target. The construction of a chimeric antibody (later named rituximab) was crucial, as the mouse antibody was unsuitable for direct use in humans. While the mouse antibody was able to bind to human CD20, it would not be able to then recruit the human complement system and immune cells that are needed destroy the “targeted” B cells. It would also quickly be recognised as foreign in the human body, and destroyed by the immune system, therefore by using a chimeric antibody with enough human characteristics, the antibody would not only recognise the human CD20 and target the immune system to it but would remain in the body long enough to destroy the B cells. To test whether rituximab would work as hoped, they performed studies in cynomolgus monkeys. They choose this species because the constant domains of their antibodies are very similar to those in humans, unlike those of the mouse, allowing the chimeric antibody to function as it would in humans. Following administration of rituximab the number of B cells in the monkey’s bloodstream fell dramatically. The numbers were also reduced in the bone marrow (where B cells are produced) and the lymph nodes (where they are activated to target foreign molecules). Rituximab administration was non-toxic and in the weeks after treatment finished the number of B-cells slowly recovered. This is important as it demonstrates that the treatment didn’t harm the monkey’s bone marrow stem cells, an important consideration since these cells are required for a healthy immune system. Rituximab was an ideal candidate to treat NHL and the promising results in monkeys prompted the scientists to conduct phase I clinical trials inhuman patients which confirmed that rituximab was safe and indicated that it could shrink tumors. Evaluation of the effectiveness of rituximab involved many studies of patients with Non-Hodgkin’s lymphoma. While the initial clinical trial results varied, likely due to the differing sizes of tumors between the patients, they showed it was effective at reducing B-cell numbers and tumor size. Since it’s approval numerous clinical trials have confirmed that rituximab is an effective treatment for Non-Hodgkin’s lymphoma (3). This month’s exciting study by Professor Paul-Peter Tak from the University of Amsterdam showed that rituximab in combination with the drug methotrexate could slow the progression of early stage rheumatoid arthritis (RA). 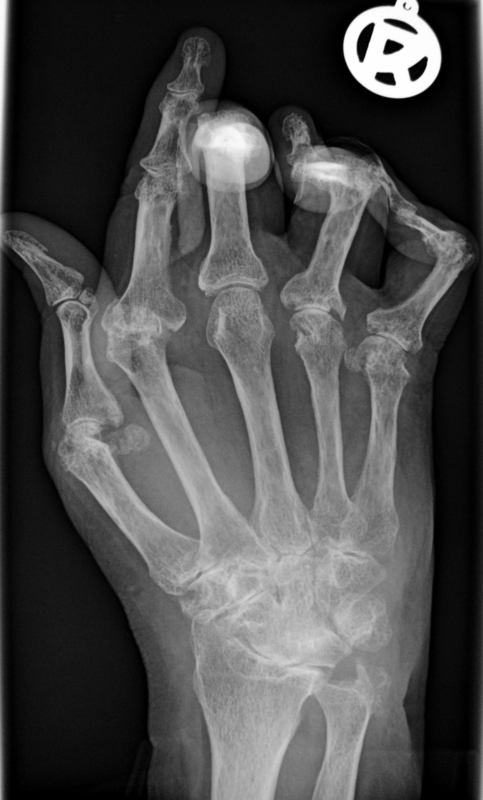 The study involved 755 patients diagnosed with RA within the last year. Methotrexate is already considered to be the best treatment for these patients and 12.5% of the patients taking only methotrexate in this study experienced significant reduction of their symptoms. However, compare this to the 30.5% of patients taking a combination of methotrexate and rituximab, and it is clear that rituximab is effective. Issues of cost have been raised in relation to rituximab, but if it turns out to be as effective in treating early RA as this study suggests, then it may ultimately save the health services and insurance companies money as slowing or stopping the progression of the disease will result in fewer patients needing the more expensive treatment and care required in advanced RA. 3) Schultz H. et al. “Chemotherapy plus Rituximab versus chemotherapy alone for B-cell non-Hodgkin’s lymphoma.” Cochrane Database of Systematic Reviews 2007, Issue 4. Art. No. : CD003805. DOI:10.1002/14651858.CD003805.pub2. Posted on July 13, 2009 July 12, 2009 by EditorPosted in News, Science NewsTagged animal research, animal testing, B-cell, cancer, CD20, disease, emma stokes, Humans, kidney transplant, methotrexate, monkey, mouse, mouse antibody, NHL, non-Hodgkin's lymphoma, Paul-Peter Tak, Professor Paul-Peter Tak, Professor Tak, RA, rheumatoid arthritis, rituximab, speaking of research, tumor, vivisection.